Vue-T-Ful® Isle Single Bucket Window Cleaner with windshield squeegee bucket and towel dispenser makes it easy for your gas station or convenience store customers to clean their car windows and windshield. 2.5 Gallon Removable Water Bucket. Reversible 'Self Serve/Full Service' Graphic. Hinged-cover towel door with small window and snap lock. Squeegee and mounting hardware included. The entire unit can be mounted to any pole or column at gas station islands and is made from durable polyethylene, making it long lasting throughout almost all weather conditions. 2.5 gallon removable water bucket fits 10" squeegee heads and features a squeegee press to remove excess water. These models made from post consumer recycled (PCR) material, 25% PCR content. All models are shipped in a carton made from 50% recycled content. Easy to maintain with a small see-through window on the hinged-cover towel door letting you know when the towel supply is low and needs refilling. 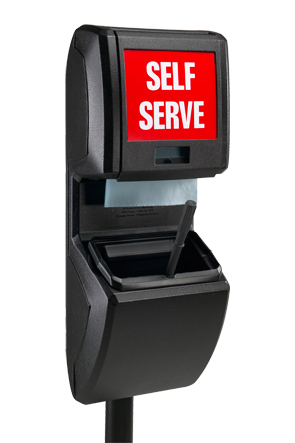 Standard sized towel dispenser accommodates 1 or 2-ply folded paper towels (suggested towel size 10" x 10") and holds over 400 2-ply. Reversible graphic included (9-3/8" W x 8-3/4" H) or create your own graphic to place in the 9-3/8" W x 8" H window. You can also order the unit with a Spanish graphic, Marathon graphic or no graphic panel at all. Available in black, blue or charcoal.